Bitcoin went through a correction and found support at around $5000 while seeing a fraction of resistance at the $5200 zone. The volume dropped slightly and another crucial support level to watch seems to be the 50-MA (moving average line), which is about to cross the 200 MA on a daily chart called the Golden Cross as we saw in several altcoins this year. Against the dollar, ETH found support at around $160 and felt resistance in this range at $170. It looks like a head and shoulders pattern, and we should take the risk that the $150 levels can be tested in the near term. Against Bitcoin, ETH found support at around 0.03 BTC while resistance lies at 0.34 BTC. Also, you can see that the MA-50 crossed the MA-200 which is the optimistic scenario. Against the dollar, XRP found support above $0.31 and saw resistance in this range seen at $0.33. Against Bitcoin, the downfall continues, and the support holds around 6260 SAT, for now, resistance is at 6600 SAT in this range. Against the dollar, EOS saw support around $5, while the resistance in this range is at $5.60. 2019 is so far a successful year for EOS: the trend has changed and EOS for $2, which was the price mark at the beginning of the year, looks like history. Against Bitcoin, the support lies around 0.001 BTC. The last is not stable. In this range, the resistance lies at 0.00115BTC. Against the dollar, BCH rallied up to $348 with support at $290 and resistance at $320. The market is pushing up, and it’s not sure we have seen the top this year. 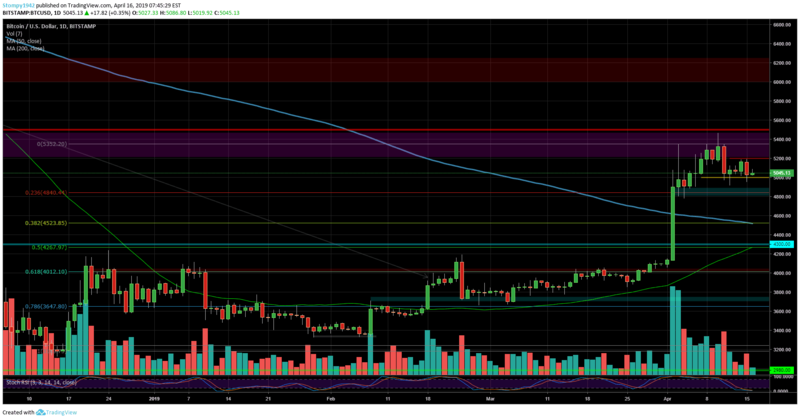 Against Bitcoin, the support is at 0.05 BTC while the resistance is at 0.065 BTC which is a large gap following the volatility, seeing resistance at these levels from major the correction in November 2018. Since then, the price didn’t return to these levels mentioned. The post Crypto Price Analysis & Overview April 16: Bitcoin, Ripple, Ethereum, EOS and Bitcoin Cash appeared first on CryptoPotato.